Since the beginning of DJ culture, Sting’s distinctive vocals have been used in samples by many producers and new bootleg versions of his songs still surface regularly. 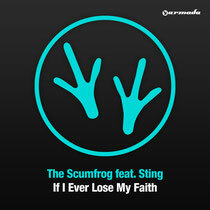 An official dance music release baring the 16-time Grammy Award winner's name is rare, but last year, however, The Scumfrog received the green light to create a new version using the original vocals from ‘If I Ever Lose My Faith In You’, and the result has just been released on Dutch record label Armada Music. The Scumfrog (aka Jesse Houk) is mostly known for his underground flavoured remixes of artists like Missy Elliott, New Order, Kylie Minogue and Annie Lennox, and his collaborations writing/producing techno oriented works with David Bowie and Cyndi Lauper. With his versions of ‘If I Ever Lose My Faith’, The Scumfrog has returned to his deep house roots, while still giving the main vocal mix his signature mass appeal. A new Scumfrog album celebrating the deeper and techier side of EDM is due later this year on Armada Music. As a DJ, he has toured the world many times over, and since 2009 he hosts a weekly radio show/podcast, called Glam Scum International. Including remixes by Carl Cox, Kruse & Nuernberg and Beckers, it’s out now.